bimetallic strip to open and close electrical contacts. This actuating device is made by welding together two pieces of dissimilar metals, such as brass and Invar, as shown in figure 4-45, view A. Below a certain predetermined temperature, this strip does not deflect or bend. However, when the strip is heated, it bends in the direction of the metal that expands the least, as shown in figure 4-45, view B. 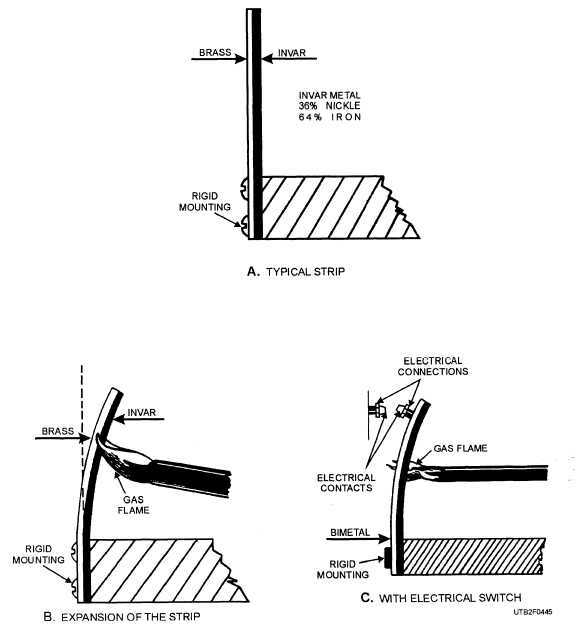 Actually, this electrical switch is constructed, as shown in figure 4-45, view C, by welding two electrical connections and contacts to the strip. A switch of this type can then be used to control electrical circuits, because the bimetallic strip responds to temperature changes. This is a basic example of how this principle of bimetallic strip operation is used in many temperature-responsive automatic units. Other control switches contain bimetallic strips that are spiral, U-shaped, Q-shaped, or even in the shape of a helix, as shown in figure 4-46. Vapor-Tension Device. - The vapor-tension principle is also used to actuate some types of automatic control units. This is a common type of temperature-measuring device in which the effects of temperature changes are transmitted into motion by a highly volatile liquid. The most used vapor-tension device is the simple compressible bellows, as shown in figure 4-47, view A. Figure 4-45. - Bimetallic strips: A. Typical strip; B. Expansion of the strip; C. With electrical switch.